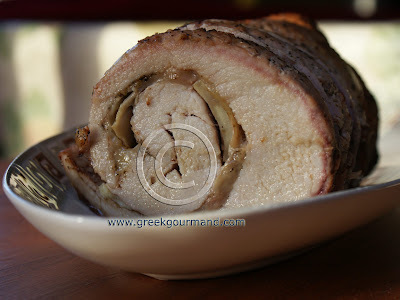 Traditionally, pork or rooster (and sometimes both) are served as part of Greek family meals on New Year's Eve or Day. Pork Loin stuffed with Kefalograviera cheese and mushrooms. Click to enlarge image. The menu consisted of stuffed pork loin as pictured above, served with a roasted tuber and root medley, and a rice pilaf topped with baked mushrooms and onions; there was also a baked chickpea dish, and a romaine lettuce hearts and cucumber salad. In addition, the table was set with a platter of assorted Greek cheeses (including Kaseri and Feta), some village style cured olives, and some Greek peperoncini peppers. For dessert, I had baked a Milopita which was accompanied by coffee, tea, and cognac. The pork loin was simply superb; succulent and moist all the way through. I had splayed the loin in a double butterfly manner to ensure as large a rolling surface area as possible. I wanted a tight and complete roll that would not leak its contents when tied and roasting in the oven. As the loin was the better part of two feet long, it was a delicate process to open it up in such a fashion, but the finished product was well worth the extra effort and care. Once the loin was cooked and sliced, I served each piece with a drizzle of jus which I reduced from the pan drippings combined with some apple juice and Greek thyme honey. Also, I had tenderized the inner surface of the meat with a mallet and rubbed the loin (inside and out) with Greek extra virgin olive oil, and had seasoned it all over with paprika, marjoram, salt and pepper. Then, I spread a layer of shredded/grated Kefalograviera cheese followed by a layer of sliced mushrooms lightly seared in butter over top of the meat, covering about two-thirds of the inside open face of the loin, and leaving an uncovered band about two inches in width running along the edge furthest from me. At which point, I rolled the meat lengthwise toward the cheese-less band, and then tightly tied it with twine at both ends and in the centre, and then again at two-inch intervals along its entire length. The final preparatory step was to tightly wrap the meat in some aluminum foil and allow it to sit on the counter for a couple hours before cooking. I wanted the meat to be at around room temperature when it went into the oven. Finally, I removed it from the aluminum foil wrap and cooked the loin uncovered on a rack over a pan in a moderate 350 oven for 1 ½ hours. From time to time, I basted the loin with the pan drippings and turned it only once to ensure an even roasting. The result was flavourful, tender, and moist. Tonight is New Year’s Eve and my wife and I will be spending it with our son, Ilias, who is still in the NICU at the hospital. Though, we do expect him home very soon. So, from the three of us to all of you, we hope 2009 brings you and yours nothing but health, happiness, peace and prosperity. Pistachios are quite popular in Greece. They are used in all manner of recipes, and Greeks also enjoy eating them roasted with salt (as pictured below) or raw. In point of fact, there is hardly a Greek home during this holiday period which will not have a bowl of roasted and salted pistachios sitting out on a table for guests to nibble on. Pistachios are used in Greek baklava; they are made into brittles, added to cakes, cookies, and any number of baked goods and bonne bouches. Roasted & salted pistachios from Aegina. Click to enlarge image. As far as I have been able to ascertain, the pistachio seed has been a part of Greek food culture since at least the 2nd Century B.C., and likely much earlier. The English word pistachio is derived from the ancient Greek word pistákion (πιστάκιον). The ancients credited the origins of the pistachio tree to Arabia and Syria. Today, the island of Aegina and the region around Megara are the traditional epicentres of pistachio cultivation in Greece; with more recent production also taking place in Phthiotis, Boeotia and the Aegean island of Euboea (Evia). 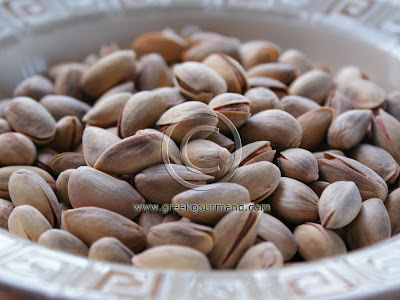 The pistachios of Aegina are considered the best and have attained preeminence in Greek marketplaces and in popular preference; they are referred to as fystiki Aeginis (pronounced: fee-STEE-kee ay-YEE-nees). However, I have found that the Megarian pistachios are equally good and they do not command the same premium in price, even though Megara is quite close to Aegina. Greece is the largest producer of pistachios in Europe and the sixth largest exporter of pistachios to the world; the bulk of global pistachio cultivation takes place in Iran. Pistachio spoon sweet from Aegina. Click to enlarge image. The first pistachio I ever tasted was immature and raw, just like the ones used to make the spoon sweet pictured above. I remember my grandmother was irrigating one of our plots in the lower plain of the village and I had gone along for "company". At ten years of age, I was a rather willful child and in constant need of curiosities to occupy my attention. So, as I was not off flipping rocks in the nearby river to find and collect crabs in my grandfather’s cap (my favorite village pastime), I was nosing about her feet and right in my grandma’s way no matter which way she turned. At some point, the old woman hastily plucked a branch of what looked like a bunch of unripe grapes from a small tree and handed them to me, instructing me to eat them and be still. Now, I cannot say that I was immediately taken with the flavour as it was actually rather “green and somewhat piny” (which is the best way I can describe it), but there was something to the texture which made it amenable to my young palate; also, I liked the way I had to pop the inner seed from its immature outer shell and right into my mouth, just as my grandmother had shown me how to do it. To this day, I have a thing for pistachios in any form. Though, I have to admit, my all-time favourite pistachio preparation remains the spoon sweet which is a specialty of the island of Aegina. Earlier this evening, my wife and I consumed the last two spoonfuls of my zealously guarded hoard of the stuff. We still have some of the roasted variety from Aegina to carry us through to the New Year, but they will not last much beyond the next couple days. Thus, all good things come to an end, in order to make room for more good things to replace them in the future. Cleaning out the cupboards, pantry, and fridge for the New Year, I leave you with that for now. My Greek Christmas bread in all its glory. Click to Enlarge Image. The many centuries-old custom of the Christopsomo or ‘Bread of Christ’ is a universal Christmas Greek food tradition. Today, all over Greece and throughout the Diaspora, Christopsomo loaves will be baked and set aside for the breaking, which depending on where you are from in Greece is performed at either Christmas Eve dinner or lunch on Christmas Day. This bread is a sweet yeast bread, and is characteristically decorated with the symbol of the cross which is usually embossed overtop of the loaf with two dough strands that intersect and divide the bread into four segments. 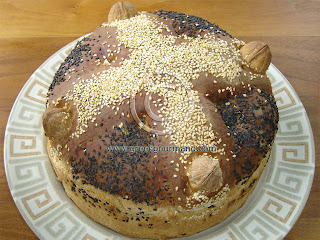 Other standard decorations include walnuts in their shells and sesame seeds (white and black). More elaborate designs are also traced on the surface of the loaf in some regions of Greece, as in Crete, where ornate symbols are carved into the surface of the bread. Usually these symbols are associated with the livelihood of the family. For instance, if agriculture is the primary activity of a given family, their Christopsomo might bear symbols that relate to agrarian activities, i.e. farming tools, crops, animals and so on. Along with the specific ingredient list (which often differs by locale), the custom of the Christopsomo usually includes a ritualistic cutting or breaking of the bread. In our family, the bread is literally broken in half by the eldest male family member present at the table on Christmas Day. This is done by placing the bread on his head and by pulling on either side until the loaf is broken roughly in half. The two pieces are then examined and if the piece that ended up in his right hand is larger than the other, the coming year will be a good and bountiful time for the whole family; if it is smaller, then the coming year will be fraught with difficulties and challenges. This recipe is my family’s version and originates in the region known as Arcadia in the central Peloponnese. Mix yeast with three tablespoons of flour, one teaspoon of sugar, and ½ cup of warm water, then set aside for 30 minutes to proof. The entire surface of the yeast mixture should foam up and rise markedly before it is ready to use. In a large mixing bowl, sift the remaining flour, then add the sugar, salt, ground cinnamon and ground clove, and then create a hole in the centre of the dry ingredients. Add yeast to the centre hole in the dry ingredients and start kneading to combine well. Once the dough starts to form into a crumbly mass, add the Mastic liqueur (or Ouzo) and then slowly add a ½ cup of warm water to the mix, kneading well all the time to combine thoroughly. Once the water has been absorbed into the dough, slowly add the olive oil and work the dough until it has been incorporated. Once the dough mass has taken shape, add the orange rind and knead it well into the dough, then add the raisins and walnut pieces and continue to knead the dough until it forms an elastic ball. Note: this dough will be a rather heavy dough and although you may use a machine to knead it through the initial stages, it will need to be finished by hand to ensure a thorough and proper kneading. Using a sharp knife, cut away a piece about the size of an orange from the dough, and further divide that piece in half so you are left with one large ball of dough and two small pieces. Knead the larger dough mass some more then place it in a round greased baking pan (I used a 9-inch spring form pan), and use the palm of your hand to shape it to fit (and evenly fill) the entire bottom of the pan. Roll out the two small pieces of dough to form two strands of equal length that will be long enough to form a cross overtop of the surface of the dough in the pan. Wet your hands with warm water and place the two dough strands on top of the bread dough in an intersecting fashion to form a cross, then press them down into the dough and continue to flatten the loaf evenly with moistened hands. Using the tines of a fork, follow round the edges of the cross formed by the now flattened strands and score them slightly to ensure that they bond with the surface of the bread and do not come away when rising/baking. Press the four unshelled walnuts into the four ends of the dough strand cross such that they stand up straight, then sprinkle the entire surface of the loaf with the white and black sesame seeds. Cover the pan with a cloth and set it aside in a warm, draft-free spot to rise for 1 ½ to 2 hours until it has doubled in bulk. Once the dough has risen, place the pan in an oven pre-heated to 350°F (180°C) and bake for one our or so, until a deep chestnut colour has formed evenly across its entire surface and the bread is ready. There you have it, a traditional Greek bread to accompany your Christmas meal. A Merry Christmas to those of you who do celebrate the holiday, and my Compliments of the Season to all. 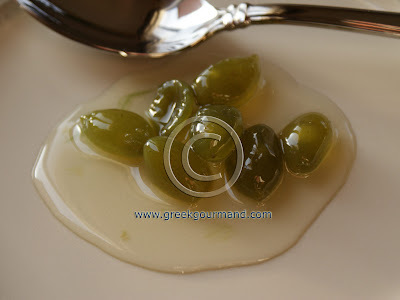 As for Greek desserts, this is one of my favourites. It is easy to make and tastes great. I posted the original recipe in March and it has generated numerous email responses from people thanking me for sharing it. I decided to publish it as a video recipe to underline the simplicity of making this pie. The original posting of this recipe along with the ingredient list can be found here. As mentioned in the video, variations of this recipe can include phyllo pastry as a pie shell, the addition of vanilla extract/flavour to the mix, as well as fruit preserves or other spreads as toppings; cinnamon can also be sprinkled overtop. I sincerely hope you will try this recipe and let me know how it turned out for you.